The artist's skill in commercial design rests on being an impeccable listener. This is what makes the job interesting: it is not only your client that you must please, it is his clients, you, the designer must cater. This is an interactive site of an online creative community. It features music sampling of musicians, images and video clips from artists, writers books with their excerpts, poetry, a calendar of upcoming events, concerts, dances and performances. There is an active online store with CDs, art prints, and books offered for sale using PayPal. The site is updated every two weeks. I spend a lot of attention on optimizing our images and meta tags for search engines. We average over 1500 visits per month. People have looked over 86,000 of our pages between January 1, 2009 to December 31, 2009. 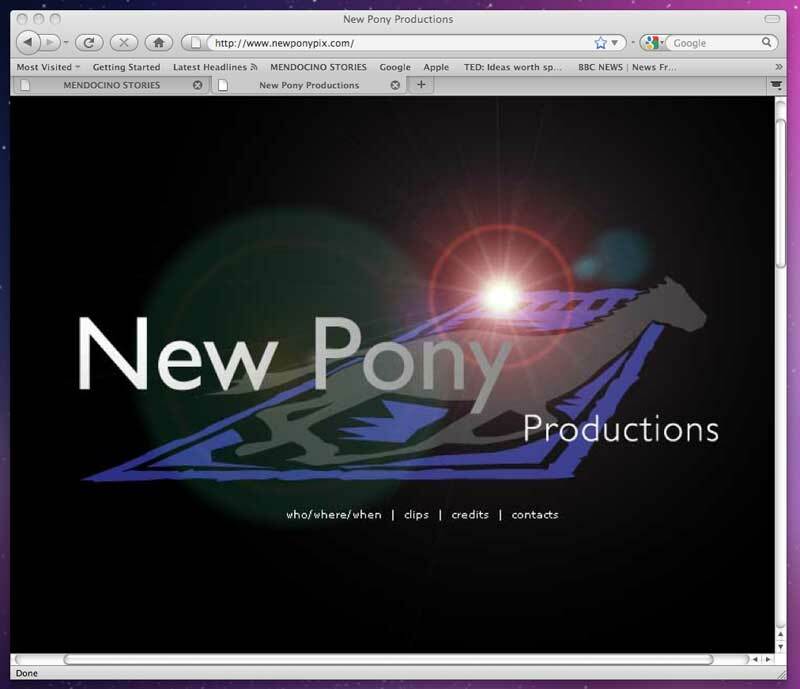 New Pony Productions - Ron Bowman is a writer, producer, animation director whose work has been represented on the National Geographic channel, Nova, Discovery and Learning channels. We have been working together catching up with the technology available on the internet. We now have streaming video clips, samples from over fifteen of his Emmy Award winning films. 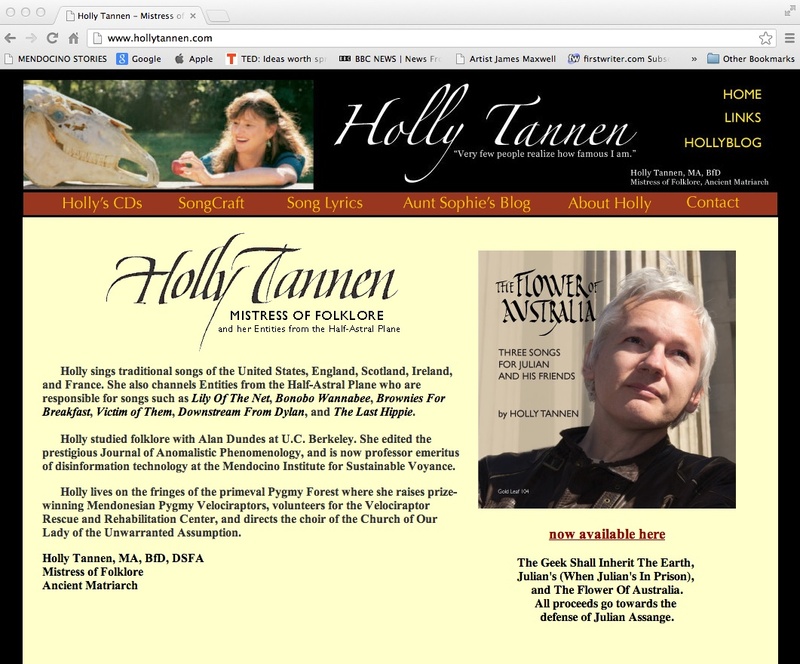 Holly Tannen is a mistress of folklore, a cultural anthropologist, a singer of particular fascination. Her recordings cronical an interest in history, protest against denial of the truth, and at best a poke in the arm to admit one may just be human afterall. 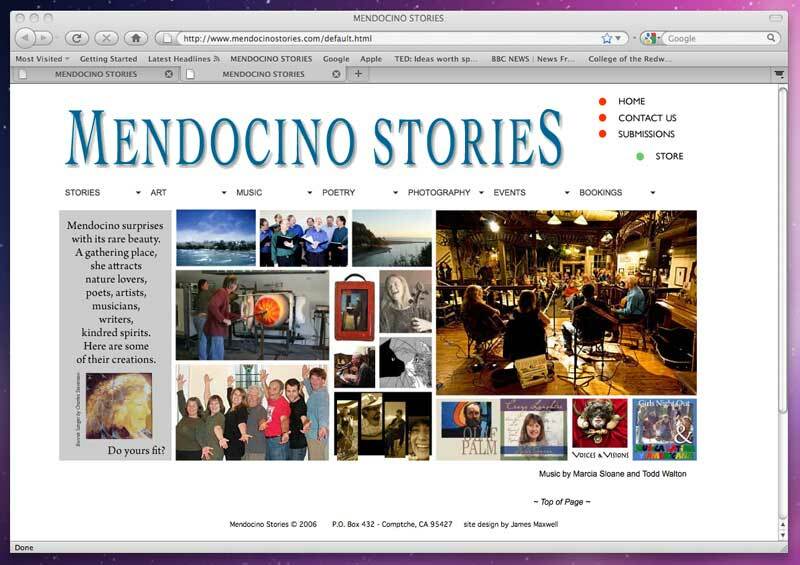 She is one of Mendocino's treasures. You can find her performances on Youtube, and from this site purchase her recordings. 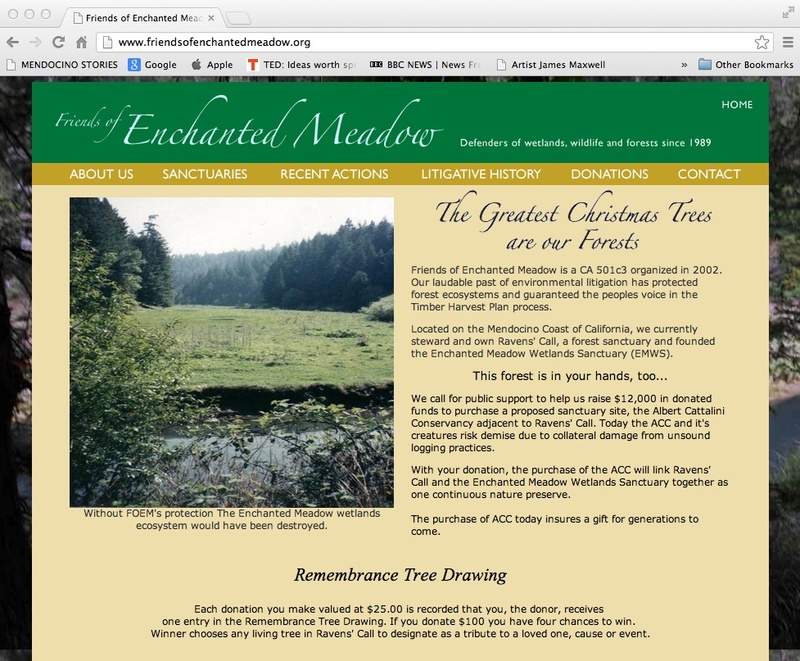 Friends of Enchanted Meadow is a nonprofit's web presence to bring awareness to the coastal environment. It is a CA 501c3 organized in 2002. The organizers say: Our laudable past of environmental litigation has protected forest ecosystems and guaranteed the peoples voice in the Timber Harvest Plan process. Located on the Mendocino Coast of California, we currently steward and own Ravens' Call, a forest sanctuary and founded the Enchanted Meadow Wetlands Sanctuary (EMWS). This forest is in your hands, too... We call for public support to help us raise $12,000 in donated funds to purchase a proposed sanctuary site, the Albert Cattalini Conservancy adjacent to Ravens' Call. Today the ACC and it's creatures risk demise due to collateral damage from unsound logging practices. With your donation, the purchase of the ACC will link Ravens' Call and the Enchanted Meadow Wetlands Sanctuary together as one continuous nature preserve. Its contents supports the work of James Maxwell multimedia artist and writer. As a graphic designer his work consists of being a teacher of watercolors, oils, acrylic, and other graphic media. He is commissioned for paintings in private collections, and public venues. His print works ranges from etchings to glicee. Author of "The Concrete Gourmet's Cookbook - Solid Recipes" - the book consists of 12 chapter of how to make objects using the refered-to concrete recipes, cement recipes, using concrete as fine art material, cement as media. The how-to use these concrete projects range from making garden planters to food safe serving vessels, worm bunkers to sculptural mixes, and day to day usable objects to follies.